Table top, bench tops and support frames made from 2"x4" rough cedar. 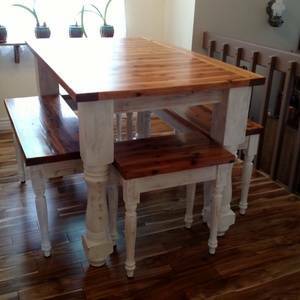 5" x 33" pine legs on table and 21" pine bench legs. 2 coats of golden pecan stain and 4 coats of polyurethane on table top and bench tops. Frames and legs painted with water thinned paint and stressed wood with sandpaper, top coated with thin coat of polyurethane, to bring out stressed wood affect. Very cool! We like that you made enough benches for each side, including the ends! Unique and so nice!